From the “we only select wood for hockey stick construction” department. 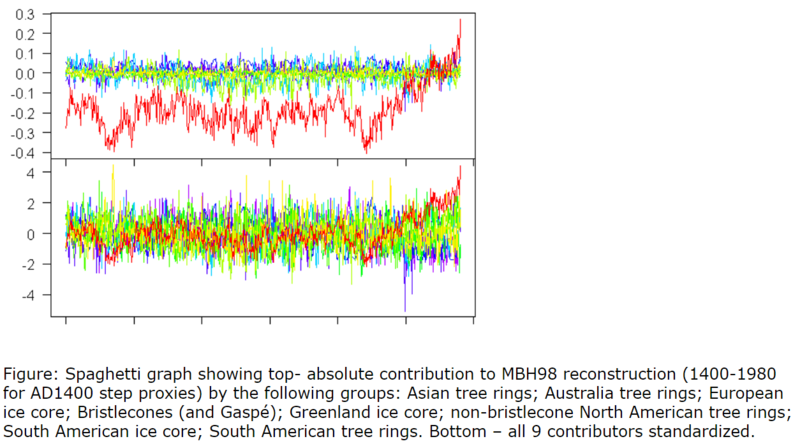 Steve McIntyre comes back into the fray with a scathing review of just how crappy the tree ring proxies used by Michael Mann were (and still are), and shows without the questionable stripbark portion of the data, why no “hockey stick” appears. But even worse, McIntyre illustrates that Mann, the hockey team, and the paleoclimate community haven’t learned one damn thing with the release of the latest set of tree ring data. the one constant in these large networks are the stripbark bristlecone/foxtail chronologies criticized at Climate Audit since its inception. All 20(!) stripbark chronologies isolated by Mann’s CENSORED directory re-appear not only in Mann et al (2008), but in PAGES (2013). In effect, the paleoclimate community, in apparent solidarity with Mann, ostentatiously flouted the 2006 NAS Panel recommendation to “avoid” stripbark chronologies in temperature reconstructions. In both PAGES (2013) and PAGES (2017), despite ferocious data mining, just as in Mann et al 1998, there is no Hockey Stick shape without the series in Mann’s CENSORED directory. PAGES2K references: PAGES (2013) 2013 article and PAGES (2017) url; (Supplementary Information). In our 2005 articles, Ross and I pointed out that the Mann’s hockey stick is merely an alter ego for Graybill’s stripbark bristlecone chronologies and that the contribution from all other proxies was nothing more than whitish noise. We noted that Graybill himself had attributed the marked increase in late 19th and 20th century bristlecone growth to CO2 fertilization, not temperature – a theory which was arguably a harbinger of the massive and widespread world greening, especially in dry areas, over the 30 years since Graybill et al (1985). In a CA blogpost here, I further illustrated the unique contribution of bristlecones by segregating the additive contribution to the MBH98 reconstruction of bristlecones (red) and other proxy classes (e.g. ice cores, non-bristlecone North American tree rings, South American proxies, etc. in blue, green, yellow ). This clearly showed that (1) the distinctive MBH98 Hockey Stick shape arose entirely from bristlecones and that (2) all other proxy classes contributed nothing more than whitish noise – with their combined contribution diminishing in accordance with the Central Limit Theorem of statistics. Mann had, of course, done a principal components analysis of his North American tree ring network without stripbark bristlecones – an analysis not reported in his articles, but which could be established through reverse engineering of his now notorious CENSORED directory – see CA post here. ) These non-descript PCs further illustrate the non-HSness of the Mann et al 1998 North American tree ring network without strip bark bristlecones. Figure 2. Plot of five principal components in MBH98 CENSORED directory i.e. without Graybill stripbark chronologies, mainly from bristlecones, but a couple of limber pines. The 2006 NAS panel stated that stripbark chronologies (i.e. the Graybill bristlecone chronologies) should be “avoided” in temperature reconstructions. Although Mann et al 2008 stated that it was compliant with NAS recommendations, Mann flouted this most essential recommendation by including all 20 stripbark series isolated from the CENSORED analysis. Because of persistent criticism over the impact of these flawed proxies, Mann et al (2008) made the grandiose assertion that he could get a hockey stick without tree rings (and thus, a fortiori, without stripbark bristlecones) – a claim credulously promoted by Gavin Schmidt at Real Climate. However, it was almost immediately pointed out at Climate Audit (here) that Mann’s non-bristlecone hockey stick critically depended on a Finnish lake sediment “proxy”, the modern portion of which (its blade) had been contaminated by modern agriculture and road construction and which had been used upside-down to its interpretation as a temperature proxy in pre-modern times. Mann was aware of the contamination of lake sediments, but argued that his use of contaminated (and upside down) data was legitimate because he could get a HS without them – in a calculation which used stripbark bristlecones. When challenged to show results without either stripbark bristlecones or upside-down mud, Mann (and Gavin Schmidt) stuck their fingers in their ears, with the larger climate community obtusely refusing to understand a criticism that was obvious to any analyst not subservient to the cause. In the weeks prior to Climategate, I used increasingly harsher terms for the addiction of the paleoclimate community to the data-snooped stripbark chronologies, describing them as “heroin for paleoclimatologists”, with Briffa’s spurious Yamal chronology as “cocaine” (e.g. herehere), occasioning much pearl-clutching within the hockey stick “community”. despite this severe ex post screening (in both PAGES 2013 and PAGES 2017), the composite of all data other than stripbark bristlecones had no noticeable Hockey Stick-ness and does not resemble a temperature proxy. PAGES 2013 and PAGES 2017 perpetuate the use of Graybill stripbark chronologies – despite the recommendation of the 2006 NAS Panel that these problematic series be “avoided” in future reconstructions. PAGES 2013 (like Mann et al 2008) used all 20(!) stripbark chronologies, the effect of which had been analysed in Mann’s CENSORED directory. PAGES 2017 continued the use of the most HS stripbark chronologies (Sheep Mt etc) both in the original Graybill version and in a more recent composite (Salzer et al 2014), while adding two stripbark chronologies used in Esper et al 2002 and other IPCC multiproxy studies. In the past, I charged Mannian paleoclimatologists as being addicted to Graybill stripbark bristlecone chronologies – which I labeled as “heroin for paleoclimatologists” (also describing Briffa’s former Yamal chronology as “cocaine for paleoclimatologists”. Unfortunately, rather than confronting their addiction, Gavin Schmidt and others responded with haughty pearl-clutching indignation, while, behind the scenes, the PAGES consortium doubled down by perpetuating use of these problematic proxies into PAGES 2013 and PAGES 2017. On this day in 2009, (Oct24) a few weeks before Climategate, I suggested appropriate theme music by Eric Clapton and Velvet Underground. Still apt nine years later. Well, it seems to me that you could have saved yourself lots of work by just reposting your objections to the original Mann HS paper, which are the same objections to every succeeding Mann-alike since then … it’s deja vu all over again. Can’t say enough for your patience in all of this, wading endlessly through the murky waters only to find the same bovine waste material as you found last time. Gotta say, if I were doing it, I certainly wouldn’t have been as … well … Canadian … in my description of these double-dealing lying malfeasant pseudo-scientists. As always, the world owes you immense thanks for your tireless work in revealing this unending deception time after time. Review here, and available on Amazon here.